Tanner Brown and Cole Shepard each had goals in regulation for Team B.C. in a 3-2 shootout loss against Team Manitoba. Forwards Justin Sourdif and John Little each finished with two shots on goal for Team B.C. Krz Plummer was a +2 with three shots on goal and two penalty minutes in an 8-3 victory for Alberta over Saskatchewan. Alberta and Manitoba emerged victorious from Wednesday’s opening contests at the 2017 WHL Cup from inside the Markin MacPhail Centre in Calgary, Alta. Portland Winterhawks prospect Seth Jarvis had himself a game to remember, but didn’t find his way onto the scoresheet until the shootout, when he notched the winning goal to lift Manitoba over British Columbia by a 3-2 score. Both teams were at each other from the opening puck drop. Undisciplined play from the home side resulted in three first period power-play chances for Manitoba, which generated some solid chances as Jarvis got his first few shots of the game. British Columbia found their way onto the man-advantage later on into the first, but Manitoba goaltender Nikulas Jerris was equal to the task, making 15 first period saves. Manitoba finally made use of a power play early in the second. With Justin Sourdif (Vancouver Giants) in the box for British Columbia, a scramble in the crease eventually saw the puck cross the line for the first goal of the tournament, with Winnipeg native Reese Belton (Kamloops Blazers) eventually getting credit for his first of the tournament. 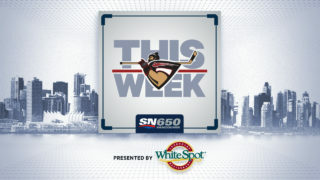 British Columbia answered right back on the power play 10:24 into the period as Tanner Brown (Vancouver Giants) scored his province’s first goal of the tournament on a knuckle puck of sorts through traffic even up the game. To their credit, Manitoba kept coming. Luc Benedictson (Calgary Hitmen) was in the right place at the right time as he potted a loose rebound past Koen MacInnes (Saskatoon Blades) at the side of the net to restore his team’s one-goal lead. The back-and-forth action kept coming with both teams earning high-quality chances with Jerris and MacInnes doing their upmost to keep the game close. MacInnes’ saves eventually bided enough time for his team to strike at the other end. 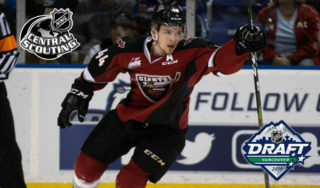 Payton Mount (Seattle Thunderbirds) found himself on a two-on-one and fed the puck over to Cole Shepard (Vancouver Giants), who evened up the scoring after 40 minutes. The third period featured everything but scoring. British Columbia defenceman Ryan Helliwell (Portland Winterhawks) delivered a big hit along the boards to Manitoba forward Jakob Brook (Prince Albert Raiders), sending him off the ice temporarily. Brook would return though, showing no ill effects. The scoring chances kept coming for both teams. Ty Thorpe (Victoria Royals) fed the puck to Brandon, Man. native Nolan Ritchie (Brandon Wheat Kings, who put a strong shot on net that was juggled by MacInnes before he eventually caught it in his glove. Jarvis continued to get closer to finding the back of the net in overtime, breaking in on the wing and shooting the puck just wide of the net. The game would head to a shootout. Electing to shoot first, British Columbia’s Kalen Szeto (Saskatoon Blades) was stopped by Jerris on his shot attempt. Shooting second, Manitoba’s Cory King (Moose Jaw Warriors) beat MacInnes to put his side up by a goal. Helliwell answered back in the second round for British Columbia, beating Jerris. Ritchie missed on his attempt to keep the two teams even in the shootout. 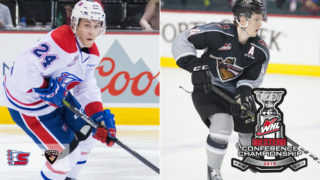 Cole Shepard (Vancouver Giants) missed on his attempt for B.C., setting the stage for Jarvis, who shot third and made no mistake on beat MacInnes to deliver Manitoba an important victory. As the top pick from the 2017 WHL Bantam Draft, Kaiden Guhle knew there was going to be eyes on him Wednesday as his province opened their WHL Cup round-robin schedule against Saskatchewan. 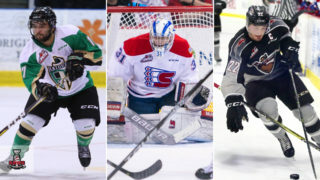 The Prince Albert Raiders prospect didn’t disappoint them either, scoring a pair of goals while teammate Noah Boyko (Lethbridge Hurricanes) added a goal and three points in an 8-3 victory for Alberta at the Markin MacPhail Centre in Calgary, Alta. At the other end of the ice, Garin Bjorklund (Medicine Hat Tigers) started the contest for the Wild Rose province, allowing one goal in 30:02 of action and earning the victory. He then gave way to Sebastian Cossa (Edmonton Oil Kings), who allowed two goals during his stint in net. Saskatchewan were the first team to put a puck past an opposing goaltender Wednesday, but it was immediately waved off by the referee, who was in a good position to see the puck gloved into the net, keeping the score at 0-0. With Bjorkland and Saskatchewan goaltender Bryan Thompson (Red Deer Rebels) turning aside shots, Alberta was the first to strike as Ridly Greig (Brandon Wheat Kings) was sprung in on a break away, scoring Alberta’s first goal of the tournament 15:38 into the period. That late goal would be the only one of the first, but would spark Alberta’s offence for the following two periods. Boyko doubled Alberta’s lead exactly one minute into the second. 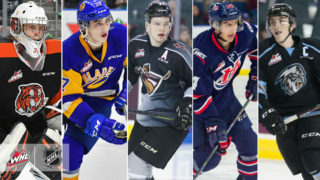 Meanwhile Bjorklund continued to turn aside the shots he did face, though Saskatchewan eventually broke through for their first goal, as Kaden Kohle (Tri-City Americans) tipped an Alex Ozar (Saskatoon Blades) point shot on the power play to cut the lead in half. “Our team had a lot of high expectations so finally getting out there and getting with the boys and seeing how good we are is really [good],” Boyko said. Alberta restored their two-goal lead six minutes later as Guhle potted his first of two goals by banking the puck into the net off Saskatchewan forward James Form (Kootenay ICE). Exactly 90 seconds later, Connor McClennon (Kootenay ICE) added to his team’s lead with his first of the tournament. Cohner Saleski (Prince Albert Raiders) brought Saskatchewan within two after 40 minutes, but Alberta kept coming on what was at time a frustrating first game for the fourth-place finishers from 2016. Saskatchewan captain Ryder Korczak (Calgary Hitmen) acknowledged the talented roster Alberta had put together, but felt his team still played well despite the score. “They’re a good team; they’re very skilled,” Korczak said. “We’ve just got to get the puck to the net and get in the [offensive] zone a bit more. 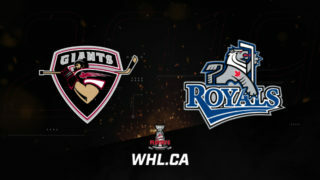 The third period didn’t bring much relief to Saskatchewan as Ethan Rowland (Red Deer Rebels), Logan Dowhaniuk (Edmonton Oil Kings), Guhle and Jordan Borysiuk (Red Deer Rebels) all added goals to round out the scoring. Bjorklund faced eight shots in the game, making some spectacular saves in-tight against Saskatchewan. Cossa allowed two goals on nine shots during his time in net. Thompson finished with 31 saves on 39 shots, but still managed some spectacular saves, including a beautiful toe save on Rowland to keep Alberta from securing another goal. The teams will switch up opponents for Thursday’s contests as the tournament enters its second day. Alberta will host British Columbia while Saskatchewan will host Manitoba. Players like Boyko were expecting a nothing short of a fierce challenge Thursday evening against their provincial neighbours to the west. At 0-1, Saskatchewan will be heading into a make-or-break game against their other provincial neighbour in the afternoon contest. Korczak believed his team was close to finding the winning formula to get them on the board at the tournament.